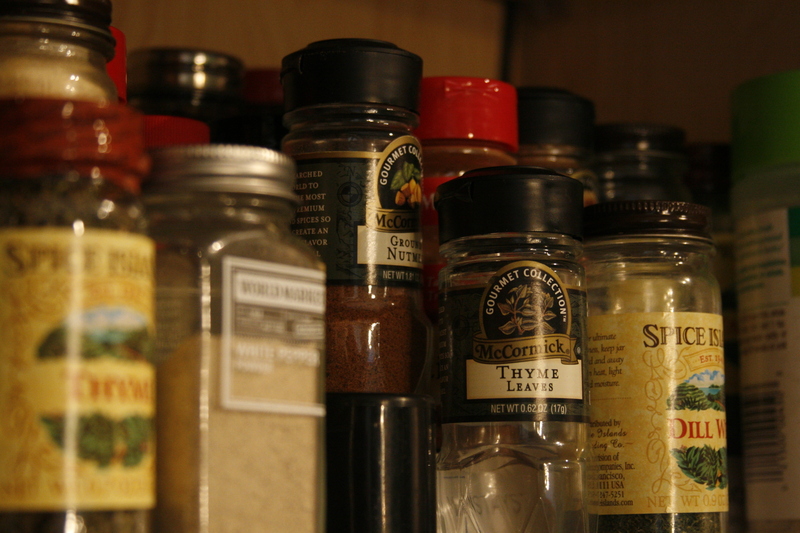 Spices are great for taste, health, and filling up cupboard space for the modern cook. Every serious foodie has an arsenal of spices at their disposal, Swedish-chef style as powders go flying every which way, adding a little of this and a dash of that to a vat of any bubbling concoction on the stove. Well, at least that’s what should be in the “what my mom thinks I do” slot in those popular charts about career perceptions being passed around Facebook these days. Truth is, spices are amazing. Simply adding a dash can enhance or tweak a flavor, anything from sweet, sour, hot, or salty. Spices do it all. What I also love about spices, too, is that not only do they round out the flavor of your favorite dish, but they’re good for you. Hot spices like cayenne improve circulation. Garlic is one of the most potent and natural anti-fungals out there. And the list goes on. They’re from plants, and therefore a natural addition, like any vegetable or fruit on your plate. And they’re a great, healthy alternative to the traditional salt shaker. What made me think of writing about this is because I recently came across an article by Monica Reinagel that talked about the shift in the use of spices over the past couple of generations. Like everything else, choices have become abundant. Go to a Starbucks and try to order a coffee. You can’t just go in and ask for a coffee, you have to know dark or light roast, flavor shots, etc., etc. And so have the varieties of spice choices likewise increased over the years. “[T]oday’s home cook is likely to keep at least 40 different seasonings on hand, whereas the typical 1950’s American homemaker relied on fewer than 10 spices,” Reinagel reported. Wow- that’s quite the change. People today like variety. People like choice. Perhaps the world has become a lot more creative, or just a lot more celebratory of the individual. Each preferred flavor (for example, either sweet, hot or smoked paprika) gives us each endless possibilities to make our own unique creation. Whether you want Thai, Chinese, Mexican, or Italian, each culture has its own palette of spices to choose from, and gives us each an individual, personalized culinary experience. Maybe that’s why “nothing’s better than mama’s homecooked food” has taken off as much as it has. No one person makes a meal the same way as another. Try as you might, your spaghetti sauce just never quite comes out the same as grandma’s. On the other hand, watching your parents cook and use fresh spices can be as much a part of a family tradition as holidays and family vacations. The arcane world of spices and their power was introduced to me from a very early age. My father was the cook in our house, and the worst kind – the “adventurous” kind. You never knew what would end up in that meatloaf! And throughout my childhood, my father always had what we referred to as the “spice cabinet”- a particular section or shelf of our cabinet dedicated specifically to our assortment of spices. The smell was such a mess of crazy scents, that I would hold my breath anytime I had to open it and look for something else that had the misfortune of being stashed in the same cabinet. Yet when I bought my own home, my first order of business in stocking my kitchen was not getting pretty china, the best utensils, or even worthwhile pots and pans. No. I started building up my own “spice cabinet.” I wanted a cabinet that would expunge a cloud of earthy, potent scents each time I opened it. That said “home” more than anything else in the world. So every time I went to the market, I picked up a bottle of spice or two (whether I had a recipe laying at home calling for it or not. If I’d heard of it, it went into the cart). I have to say, between 30-40 spices sounds about right for what’s now in my personal spice palette. Strangely, though, it wasn’t until recently that I actually started USING them. I think spices my parents had stored away throughout my youth might still be sitting in their cabinet today….the same bottles. I knew that over time, spices can lose potency, but it was only recently that I experienced it firsthand. I have bottles of spices now, never opened, that are about two years old. When I began using one, and decided I enjoyed using it often enough to buy another bottle, the taste of the new bottle was like night and day. Today, my main go-to spice for nearly every meal is garlic powder. I mean, it goes on nearly everything in place of salt. And I don’t think I could live without Italian seasoning in my salads! The horror! Now, I am opening up bottles and using them at every chance to see what other “can’t life withouts” are lying in wait in that cabinet. Cooking is alchemy, if I dare to quote from the HBO Series Six Feet Under. You never know what a spice can do for your dish until you try it. So don’t be afraid of that spice aisle at the supermarket. Pick one up. Add it to salad. To your potatoes. Your rice. Your meat. Not only will it make your meal a little more exotic, but you never know what part of your health may improve just from adding a little spice to your life. And, oh, the choices you have…. Personally, I’d have a spice cabinet just for the smell. The mix of odours must be the culinary equivalent of a Jackson Pollock painting.